Browsing articles tagged with " steel barn siding protection"
Coast to Coast constructs all of its buildings using only the strongest of steel barn siding. Our structures are available in a wide assortment of layouts and colors. In addition, styles can be selected or built to match existing structures and/or surroundings. We offer multiple roofing, window, door and other optional features in order to help further customize your building. Those living in areas with extreme weather conditions can choose from our line of buildings that have been constructed to withstand circumstances such as snow, ice, wind, heat, etc. People in the agricultural industry have been counting on Coast to Coast’s durable steel barn siding constructed buildings for years. From protecting livestock, to storing grains, to housing farming supplies; our metal structures are built to last. Our steel barns are one of the most affordable and enduring building solutions. They hold up to many conditions and circumstances that traditional wood and nail barns simply cannot withstand. Our all-steel buildings are available in either 12 or 14 gauge galvanized steel which helps to ensure both strength and longevity. Wall heights on standard units are available up to 12 feet high, making the storage of your agricultural valuables both hassle-free and easy. Should a taller barn be needed, Coast to Coast can customize a building that better suits your needs. We will do whatever it takes to provide you with the steel barn siding structure that is right for you. 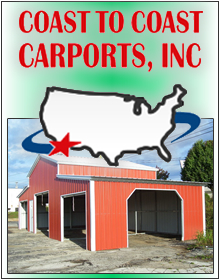 Coast to Coast Carports is dedicated to supplying its customers with building units that are extremely high in quality, as well as wallet friendly. We have buildings certain to fit any budget, big or small. Investing in a metal structure is hands down, one of the most economical and fastest ways for instating effective protection and shelter, wherever it is needed. Coast to Coast has a friendly staff of building experts who will happily help you to find the most ideal building solution for your specific situation. You just give us the desired specifications and we will handle everything else. We’ll make sure that you get the steel structure that contains the options and features that you want.